← Thanks Mission Beach..hello to 2 new walkers! Kerry, Daniel and myself spent a comfortable night at Feluga after a lovely meal with Judy and Pat then Daniel drove the support vehicle, stopping periodically so we could refill our water bottles and have lunch. It was the hottest day we have had so far. Response from trucks and cars was less than when walking into Bingle Bay but enough to keep our spirits up. 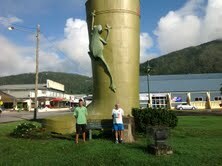 We stopped at Tully to pick up some supplies and a photo at the Big Gumboot – see the picture!. Sue kept in touch with us and gave directions to her farm at Murray Upper. We arrived early and it was suggested we visit Murray Falls, and what a treat they was,so much water gushing over the rocks, Daniel couldn’t help himself, had to go for a swim, it was far too cold for Kerry and myself. Daniels friend Tania joined us for a great meal at Ann and Laurie’s place then back to Sue’s to sleep. I will try to include last names next time so you can keep up with all the walkers. I was thinking you might all be a bit hot that day. And today and yesterday as well. Has been sunny since I left you at eh school corner. Cloud cover tomorrow. Lots of block out. Take care. Thinking of you all the way, Helen.